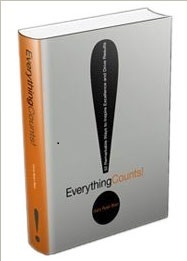 I just finished a new book that I think has a little of something for everyone; Everything Counts, by Gary Ryan Blair. I know, the title sure seems kind of counter-intuitive. Most of us have come to the conclusion that if everything is important then nothing is. So how can everything count? “Everything” really boils down to just one thing. Being obsessed with excellence. I love that. Most of the time when we hear the word “consequences” we tend to think of negativity, but every action has a reaction. Positive actions will spur positive reactions or positive consequences. While negative will only bring negative. -there are 52 chapters. You could focus on one strategy per week over the course of a year if you wanted to. -each strategy gives us a call to action; directions on how to move forward to apply what we just read. -each strategy also gives us a real life example of either a person or a company who exemplifies the trait. The strategies are also broken into 3 categories: professional, personal, and universal. You will find that there is repetition in some areas. For example, being a lifelong learner is similar to personal development. I look at that as a double positive. The first bonus is that it is pretty inconceivable that if you improve your professional traits that it won’t carry over into your personal traits and vice versa. The second bonus is that we learn through repetition. The chapter I am going to work on first is Resiliency Counts. Here is the call to action for this section. Do you understand the benefits and purpose of resiliencey? Do you consider yourself a resilient person? No, this is not a strength of mine. I don’t quite react like the book describes, I loathe victim mentalities, but I do stress out. Do you believe that everyone should embrace resiliency as a career and life skill? Why do you feel this way? Definitely. The stress created by this rubs off on the people around us in the form of negative energy. What step will you take to sustain good health and energy when under constant pressure? I will slow down and prioritize better. What are you working on to improve?